Another year has been past, this means that we have again our annual event where we can get our best suits and bowties. Why? Because this is madness Sparta the eighth occasion of Räbinä Awards! So what is this award thing about at all? This is an election, in which the community decides, who has done in the previous year something extraordinary. To make your job easier, there are several categories, in which you might nominate, and then elect your favourite fellow GR players. These apply for track and car creators, competition managers, commentators, rookies and general community members. Honorary awards are handed by the Räbinä Awards Commitee to two members of the community. One of these goes to someone, who have done an outstanding performance in the previous year. 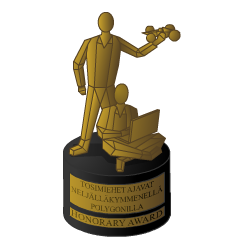 The other honorary award is given to a person, whose memory should be kept alive, and his creations are showing us example in the community. At the first glance, let us take a look back in time, whom did we think, he is eligible to win the Golden Räbinä this year! But before you would hurry towards the local dress rental or your tailor, we should also decide, who should be nominated for the Räbinä Awards this year. For this, do not forget to read the rules down there! C. Only a member of GR community, who posted first time in GRIF from 1st Jan 2015 to the end of year 2015 and had not posted previously at past official forums, is nominateable for category Rookie of Year. H. Members may nominate until 23.59.59 GMT of 1st February 2016. F. Members may vote until 23.59.59 GMT of 15th February 2016. C. All votes (including its reasoning) and summarized results will be published in GeneRally Gala Thread 2015 as soon as possible after the end of voting term. And now a bit seriously: I am kind of worried about the decreasing number of active members, which makes me question, if the Gala should be held for the following years. No worries, this year's awards are not in doubt and I would be still glad to keep this ceremony alive, but if the critical mass would be missing the event, or the nomination list would be too short (taking also the number of active members in considerability), this might be the last gala of the community. Since I was not that active last year (shame on me), I might ask you, on what is your nomination based. This might happen via PMs, so do not be surprised if I am curious about the idea of your decision. Last edited by Herbal on Wed Mar 23, 2016 6:50 pm, edited 8 times in total. In Competition/Track-/Carmaker yes. But no Commentator nominations so far and only 4 Community member nominations (including myself). You still have eleven days to submit me the nominations! Last edited by Herbal on Sat Jan 30, 2016 3:12 pm, edited 1 time in total. 8 days until the end of nomination phase. Make sure your favourites are not missing from this list! Still no more nominations? You only have 3 days remaining until the end of nomination phase! By the way, how can Areen be nominated for Trackmaker? I don't remember him releasing anything last year. You're right, Lorenzo, it was a mistake of mine, I've jumped a row while checking the time of topic (and track) releases. BTW there is still 56 hours until end of nomination phase! Alright guys, the first part of Räbinä Awards is over. Now comes the election phase, which means that you have approximately 2 weeks to send your votes to Buka via PM. Deadline is for that the 15th February 2016. EDIT: Of course I have forgotten to mention an important thing to you. You are advised (if you wish) to make a short comment about your decision, why you have decided to elect your favourite in each category, which is going to be public in the envelopes. There is still 4 days remaining until the end of election phase of Räbinä Awards. Do not forget to send your votes and add a short comment about your decision! Make Buka's (and mine) Valentine happy with sending a vote to him! You still have 36 hours for doing this. Just 6 hours remaining from the election of Räbinä Awards 2015! Send your votes if you haven't done that so far! Me and Herbal decided to extend the deadline. You still can vote until 23.59 GMT 21/02/2016. The reason is the fact that even me - the so-called organizer - wasn't aware of the election (my bad, I need to visit the forum more often ). Maybe an extra week will get us more votes. At the moment we have 9 of them - from Trigger Happy, RobertRacer, Marcinho, K5054, marinator, Herbal, Gzehoo, TuomoH, XYY. There is still some time to send your votes to Buka: you have 3 days and 4 hours remaining! This is the last day of voting for Räbinä Awards! If you STILL have not sent your votes to Buka, you can do that in the following 10 hours! BTW, when will the Räbinä's start? Alright guys, Buka has sent me the results, so I can proudly announce that the Räbinä Awards will be held next weekend. The ones, who might present the results will be informed during the following days. Check your PMs, since who knows, maybe YOU will be a presenter next weekend! Do not miss out the Räbinä Awards Gala 2015!